Who produces better films, feminists or anti-colonialists? Supposedly, a prominent Swedish feminist filmmaker and her grungy Argentine colleague will be joining forces to co-direct a typically co-financed, festival-only kind of film, but nobody is working in concert on this shoot. Every kind of ism and all sorts of international film production conventions are skewered in Alejo Mouguillansky & Fia-Stina Sandlund’s self-referential many times over The Gold Bug, or Victoria’s Revenge (trailer here), which screens during the Film Society of Lincoln Center’s Neighboring Scenes: New Latin American Cinema film series. Moguillansky, playing himself, is about to start co-directing an explicitly feminist film with the Swedish Sandlund, funded with hipster European grant money. The idea is to make a bio-treatment of Swedish feminist author Victoria Benedictsson. 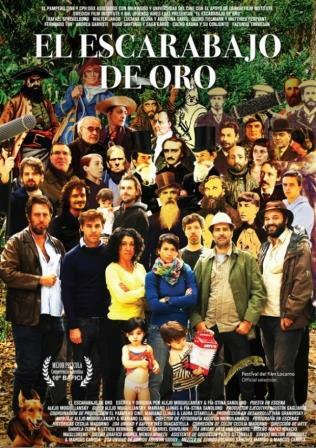 However, unemployed actor Rafa convinces his colleagues to make a film about failed radical Leandro N. Alem instead, because he has come into possession of a map to buried treasure outside the city of Alem. Frankly, the town has nothing to do with Alem besides being named in his honor, but that hardly matters. Caught up in his enthusiasm, Moguillansky calls Sandlund to convince her to make the eleventh hour switch (swapping one Nineteenth Century suicide for another), shamelessly playing the colonialism card. He can bamboozle the European producers, but Sandlund remains dubious. Presumably, since she is stuck at a feminist conference in Miami, she will be powerless to stop them. However, like Charlie on the phone to the Angels, the heard but never seen Sandlund will exert a powerful force from the shadows (remember the second part of the title). Of course, the meta-meta film isn’t called The Gold Bug for no reason. Just as in Poe’s story, the map is only one clue to the treasure’s location. There is also a cryptogram to be cracked. Naturally, this will require a lot of madcap running around. Unbeknownst to Rafa and his cronies, two women on the crew, acting with Sandlund’s counsel, are conspiring to grab the treasure for themselves. There is also an incomprehensible anti-colonialist, supposedly feminist film to be made—not that they have a script to follow. Obviously, Gold Bug follows in the tradition of chaotic movie-making films, like Day for Night and Irma Vep, but it has distantly sharp satirical edge. When Moguillansky and Sandlund were thrown together as part of some grant-writing, international financing deal in real life, the concept grew out of the absurdity of their situation. Frankly, they expose a lot of the sausage-making of multinational “prestige” filmmaking for ridicule. Sandlund’s frosty voiceovers are absolutely hilarious and Moguillansky delivers some of the film’s best lines as the (hopefully) fictionalized version of himself. As Rafa, Rafael Spregelburd (recognizable from The Critic) deftly balances raging insecurity and manipulative game-playing, which probably comes naturally to many actors. In fact, the entire ensemble seems to have a collective talent for rapid-fire cross-talk. 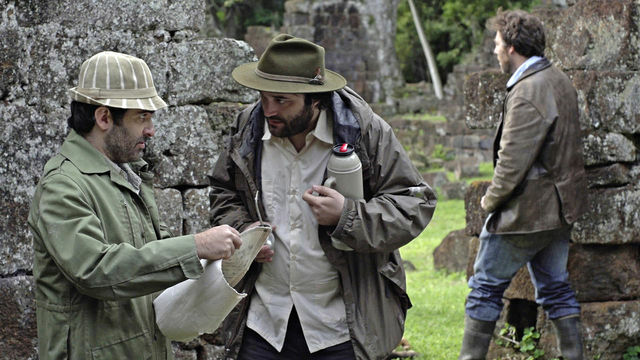 Gold Bug was co-written by Mariano Llinás, who wrote and directed the utterly brilliant Extraordinary Stories (not to be confused with Extraordinary Tales or Wild Tales). We can easily see his Russian doll influence in the narrative digressions and intriguing historical flashback interludes. It might be too clever for its own good, but anyone who has seen an unwatchably pretentious film at a festival and wondered how it got produced may find their answers here. Recommended for cineastes who do not mind a little metaphorical ox-goring, The Gold Bug, or Victoria’s Revenge screens Thursday (1/7) at the Walter Reade, as part of this year’s Neighboring Scenes film series.